For years and years now, films with expensive cars featured alongside a star-studded cast have been a favorite for moviegoers everywhere. From thrilling action films to racing sporting movies, there are lots of incredibly expensive cars in movies. Today, we’re talking about the top 10 most expensive car movies out there. When the remake of this movie was created, the decision for the car was a big one. This car was chosen as the main vehicle to be driven by lead star Nicholas Cage, with co-star leading lady Angelina Jolie. The film from 1966 Spinout was an extremely popular film when it came out, as it was one of the only films that Elvis Presley himself ever starred in. Presley played the lead character Mike McCoy, who was the lead singer of a band and raced cars in his spare time. This car in particular was one of the two cars featured in the movie, and this car was used in the movie to tow the other car by Presley’s character. This car is the one that was driven by Steve McQueen during the opening scene of the film Le Mans. McQueen drove the car through the countryside in France at an insane speed for the movie. 7. 1955 Ferrari 750 Monza SpiderMovie: On The BeachPrice: $2,530,000This two-seat sports car was used in the thrilling apocalyptic movie On The Beach, based on a novel written by Nevil Shute Norway. It was one of only 35 models like it built, and it has remained restored perfectly. One of the most memorable aspects of the famed James Bond film was the Aston Martin DB5. This car was full of impressive gadgets and technologies, including tire slashers that were retractable, bullet proof retractable screens, radar scanners and a passenger ejecting seat. This Italian classic film featured this impressive vehicle in 1956. The film, set in Rome, starred Marcello Mastroianna and Sophia Loren. This car was specifically built for racing events and is a rare, valuable vehicle. 4. 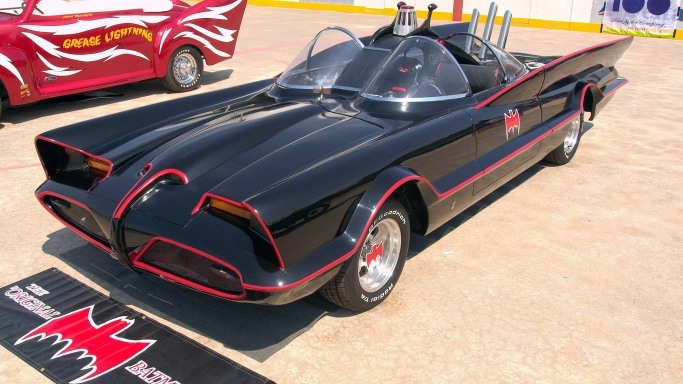 Batmobile (original)Movie(s): Batman the Movie and It Started With A KissPrice: $4,620,000Even though other vehicles have sold for a higher amount of money than this one, the Batmobile is regarded as one of the most influential and significant cars in film history. It began its life as a concept car, and then the 19-foot long two seater was built by hand by Carrozzeria Ghia in Italy. 3. 1956 Ferrari 250 GT LWB BerlinettaMovie: The Love BugPrice: $6,710,000This well known automobile is well known as the “Tour de France” model, after winning the running of a public roads sporting car race in 1956. After this, the car was bought by Walt Disney Studios for The Love Bug, the 1966 movie that celebrated the classic Disney tale about Herbie, the racing car with a soul. 2. 1965 Shelby Cobra Daytona CoupeMovie: Redline 7000Price: $7,685,000Despite the car not getting much screen time on the movie, this vehicle has major racing credentials. This car was used to win the Federation Internationale de l’Automobile World Championship in 1956 prior to being used for Redline 7000.1. 1968 Ford Gulf GT40Movie: Le MansPrice: $11,000,000Not only is this car famous for its film experience, but it’s also regarded as one of the most valuable vehicles in the world. It is one of only two original Ford GT40s that used bodywork of carbon fiber. This was also the car that was driven at 200 MPH in one of the highly regarded iconic motor sporting films in the history of filmmaking.